Keith Brewery laughs when you say a beer like Bell's Two Hearted goes to your head because of its 7% ABV. 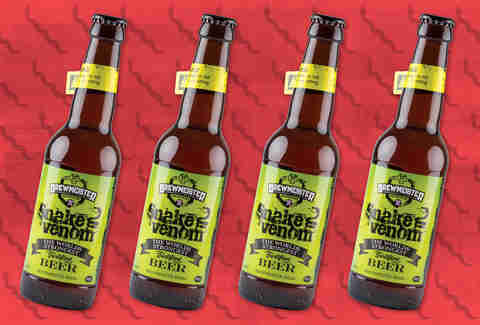 The Scottish brewer is the purveyor behind Brewmeister's Snake Venom, which they say is "officially the world's strongest beer." Snake Venom -- no actual venom involved -- has an ABV of 67.5%. That's more than you'll find in the vast majority of liquors. Vodka and whiskey come in around 40%. Snake Venom is an English barleywine that's too alcoholic to be carbonated like pretty much every other beer on the planet. "The alcohol content is too great," a spokesperson told Thrillist. "The liquid is too dense and therefore it cannot hold the bubbles in the same way a standard beer can." "We decided to create it as an experiment," the spokesperson said. "The company had tried other strong beers in the past and we realized that there was a demand in certain export markets, including the Chinese market." It is primarily exported but was recently made readily available in the UK. Unfortunately, it's not for sale in the US, making it hard to get your paws on. The fortified beer retails for around $76 a bottle and comes with a warning. It says not to pop the top and drink like an average beer, appealing as that may sound. The brewery recommends you imbibe "in 35ml measures," which is about the size of a shot glass. At this ABV, that's probably a smart way to figure out what the world's strongest beer tastes like.